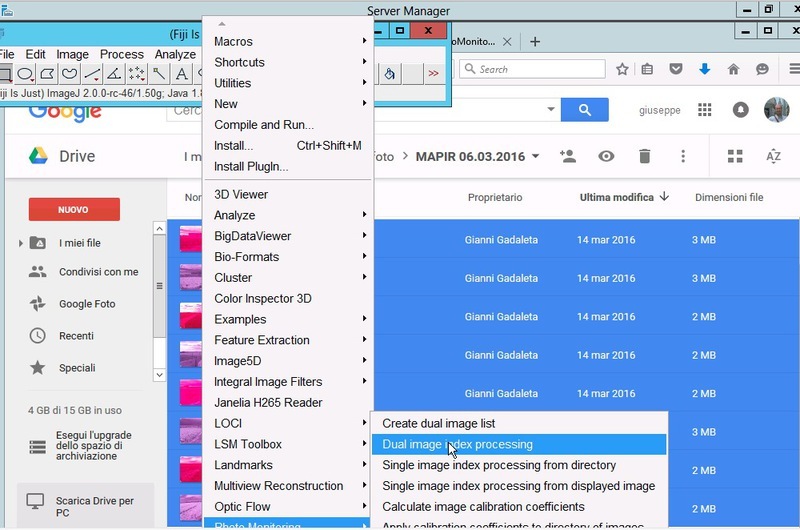  Public Lab: Help about NDVI obtained with Mapir cameras. Hi guys, it is the first time I write on Publiclab. With my group we are investigatiing on the use of Mapir camera. We have 2 cameras: red and nir. We want to build a NDVI map and we used the raster calculator of QGis. Can someone help me if the results are good or are bad? My principal doubt is about the sky: it seems to have a good vegetation index. Any idea? Any help is apreciated. 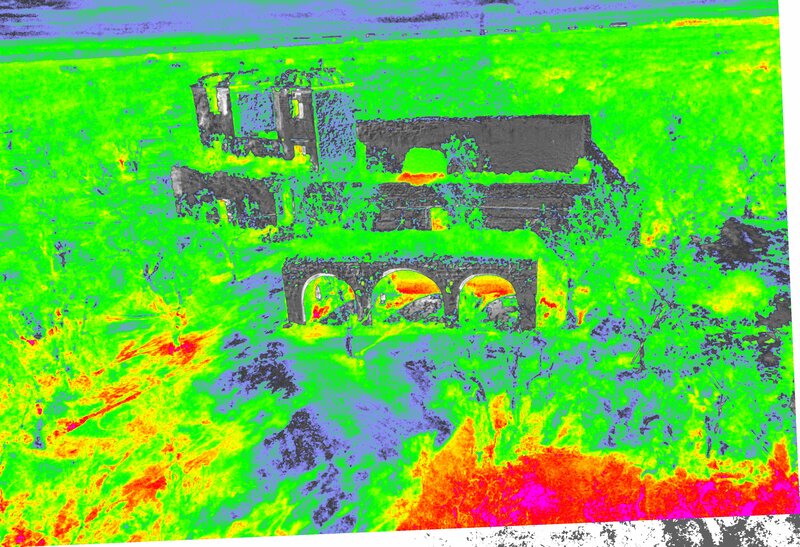 All of the NDVI values are very low. Could you also post the original photos and maybe we can see what kind of NDVI we get. Could you describe what filters are in the cameras and what settings were used to take the photos? 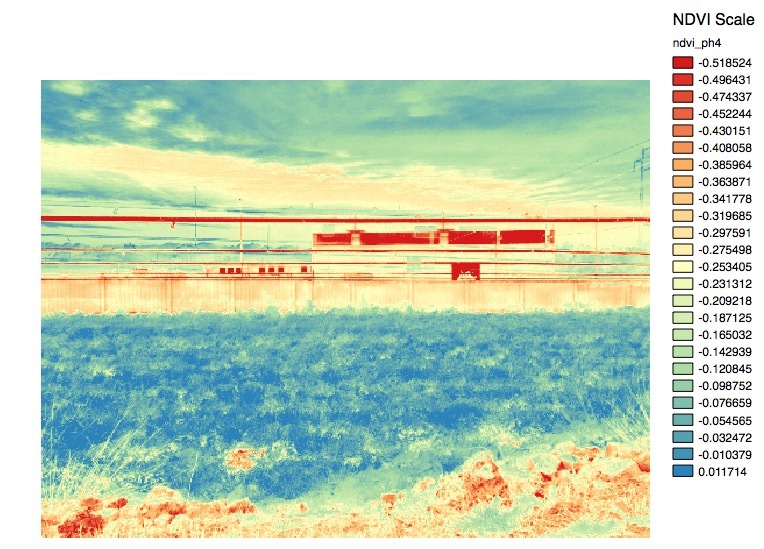 Nir camera acquires in the region of near infrared, 808nm of lenghtwave (specifications: http://www.mapir.camera/collections/cameras/products/mapir-camera-near-infrared-light) and the red camera acquired at 650nm (specifications: http://www.mapir.camera/collections/cameras/products/mapir-camera-red). Hoping these information are helpful. Thanks. Those photos look good. I used the Photo monitoring plugin to make the NDVI image below. I used the blue channels from both photos because these provided good separation between the NIR and VIS channels. The color scale is from -1.0 (left) to +1.0 (right). A lot of the difference between your NDVI image and mine is the color gradient used. 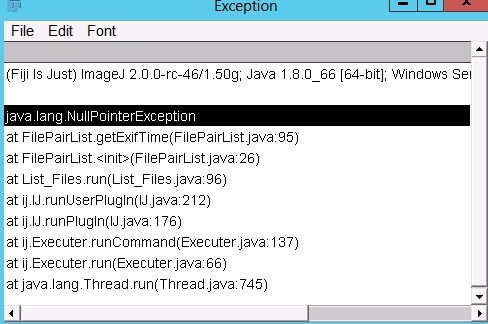 and if I restart Fiji in the plugin list I have not Photo monitoring plugin. I haven't any NDVI image on the output directory. Why? Thanks. I'm not sure about your installation problems. Maybe @nedhorning can help. I'm also not sure about the other error. 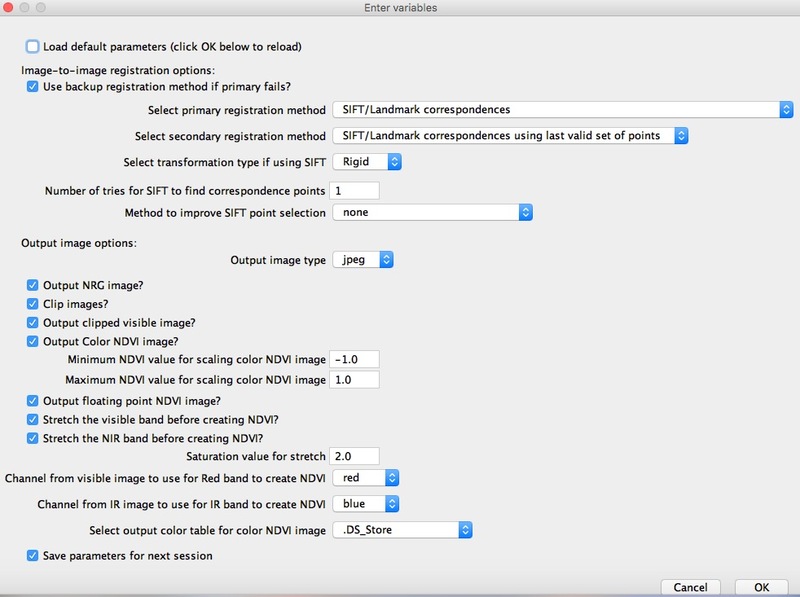 To use two photos to make NDVI, a txt file is needed with paths to the photo pair. I'm not sure what happened there. As said @cfastie at the end is required the photo pair but It is not any way to give this information. Hi all, I'm sorry for my late reply. I installed Fiji on a Windows remote virtual machine. 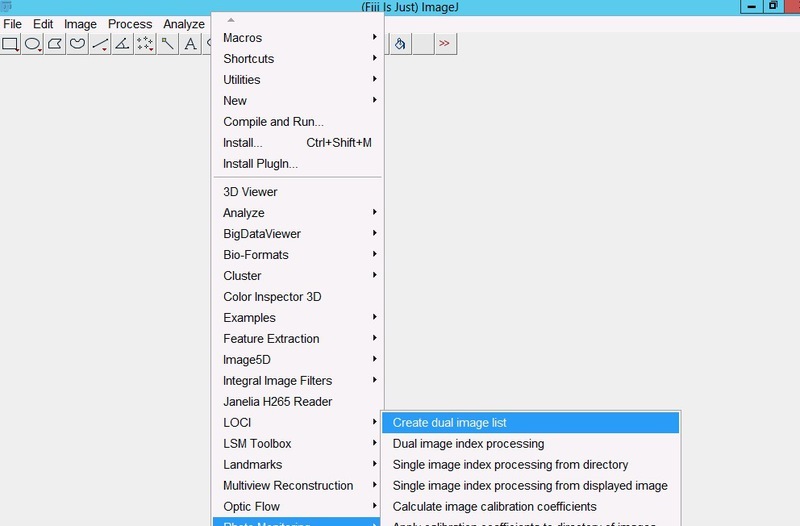 From Plugins menu I selected Photo monitoring and Dual Image Index Processing. It is strange on windows I have difficulties as on Mac. Note that it is asking for a "Photo Pair File." This is made with the plugin called "Create dual image list." It's not clear whether you have done that or not. Do you know the file format of your images? I appears that ImageJ can't read them. If you send me one pair of images and I'll see if I can find the problem. Are those photos mosaics of more than one photo? What program did you use to combine the photos? That program might not be making jpegs that Fiji likes. The program might be altering the EXIF header somehow. these photos are a mosaic of different pictures. The mosaic program used Is Microsoft ICE. These are 2 pictures not mosaic. Those photos of the cool old ruins work fine in Fiji, and the mosaic images from ICE also work in Fiji. The Photo Monitoring plugins stopped working for me recently. This was apparently related to a problem referred to in this note: https://publiclab.org/notes/nedhorning/01-13-2016/packaged-photo-monitoring-plugins-available-on-the-github-repositoy. If you install the latest version of Fiji, the plugins do not work. So I followed the instructions and installed an older version of Fiji and the Photo Monitoring plugins work again. The Mapir red camera produces a photo with three channels which record only red light. So any one of the channels (RGB) can be used for red light to compute NDVI. The Mapir NIR camera produces a photo with three channels which record only NIR light. 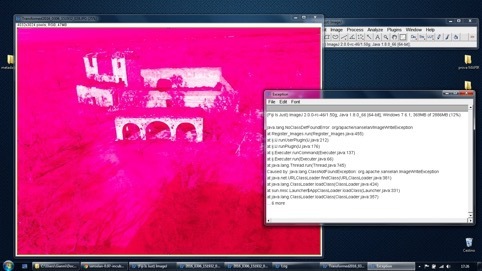 So any one of the channels (RGB) can be used to compute NDVI. I chose the blue channel for red and the red channel for NIR because it gave the best result. This is rather unscientific, but any computation of NDVI without calibration is rather unscientific. It seem the process is stopping on 25% of the elaboration (you can see it on the picture in the figure)..can you help me to understand what is the problem? Thanks!! Good news people. 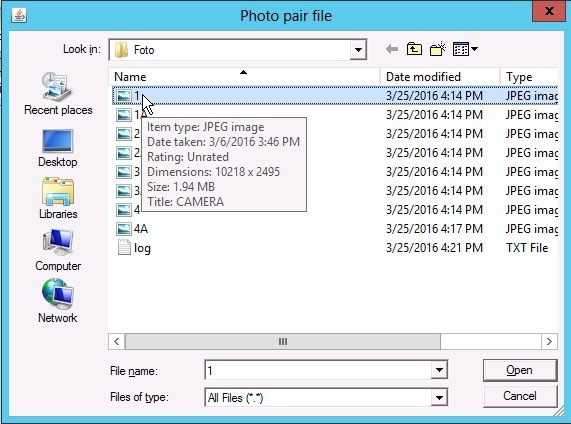 It seems that the problem is represented by the compatibility of the versions of Fiji and Photo Monitoring. Installing the versions suggested by Ned Horning the program proceeds sent up to 100% processing. My doubt however is this: Photo Monitoring in the NDVI calculation, working with a formula in which there is the value of VIS and NIR. With our MAPIR cameras, we acquire pictures in the band of RED and NIR: Photo Monitoring properly perform the NDVI index processing? 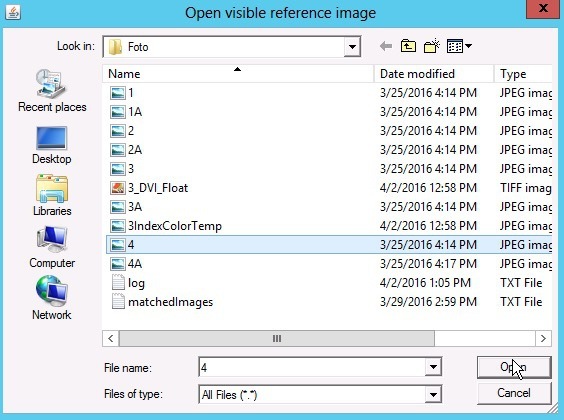 How to apply the caption of the LUT file? Thanks for collaboration Gianni. 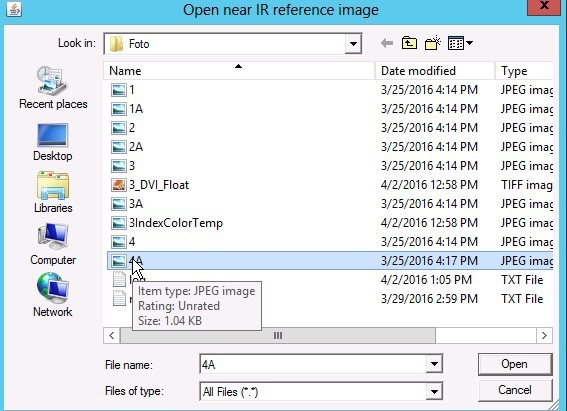 The Photo Monitoring plugin allows any band (R,G,B) to be used as the visible band (VIS). With the Mapir camera, all three bands from the RED camera capture only red light, so any one can be used. Although all three bands are red light, they are not always equally bright. So you can choose one which is much less bright than the NIR band from the other camera and the NDVI values will be in the right ballpark. This process is obviously very crude unless calibration is done. The Photo Monitoring plugin does not display the lut with the NDVI image. This has to be done manually. Hi Gianni, - We are working on a new python-based version of the plugs and that will have the ability to correct dual-photo setups like yours. It will also output the corrected photos in addition to NDVI. Hopefully there will be a version for testing a a few weeks. 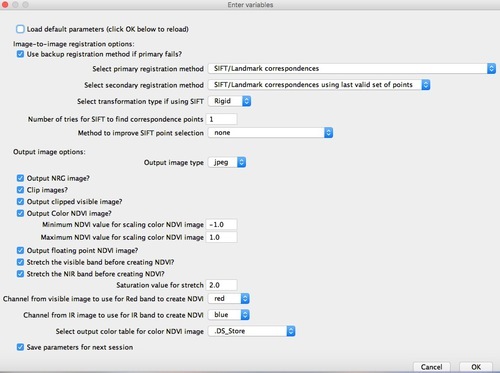 One way you can do it in ImageJ is to select the bands you want to use and calibrate from the two photos and create a new 3-band image to make an NDVI image. To do this in ImageJ use Image => Color => Split Channels to get the separate bands then use Image => Color => Merge Channels to select and merge the channels you want in the new image. 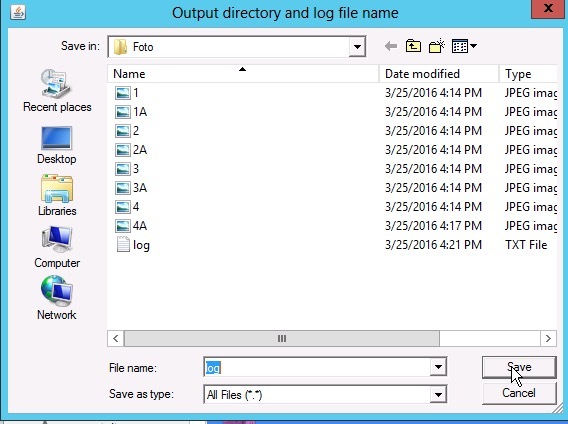 You will loose the EXIF data but you can replace it using exiftool.